The man, named only as Madanan, adopted Khadeeja when she was only 13-years-old after hearing of her plight from from a friend. He took it upon himself to adopt Khadeeja and bring her into his home. Madanan and his wife were raising two sons and says he always wanted a daughter. Although the Madanan household are observant followers of the Hindu faith, they did not ask Khadeeja to change her religion and raised her as a Muslim. The couple set up a special area in the house were Khadeeja could perform her prayers and even cooked halal food for her. 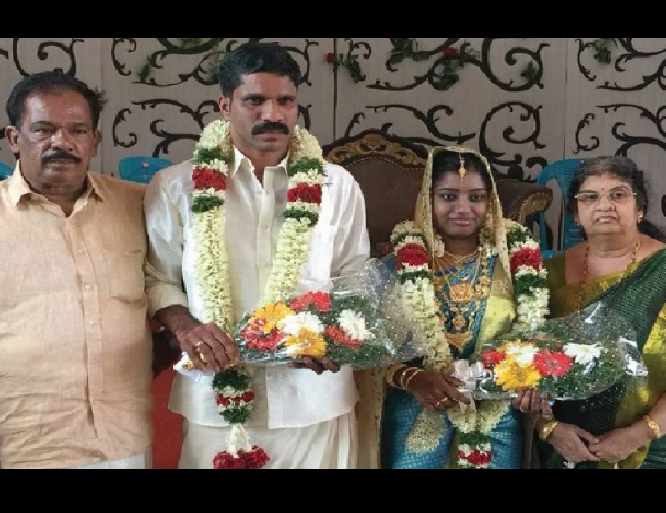 Earlier this week Madanan took the responsibility to marry off his adopted daughter to a Muslim man after searching for the right partner, and paid for all the expenses. He travelled to a local Mosque to ask them to perform the marriage according to Islamic laws and teared as he gave his daughters hand to a young man named Akbar. Madanan’s two sons who are currently in Oman and UAE are also planning to pay a visit to Khadeeja’s new home with their parents to give their blessings to their sister. Madanan and his wife said they will continue to look after their daughter forever and the marriage won’t change that, “Her marriage doesn’t change anything. She will always be our dear daughter,” the couple said.